Now available in English for the first time! The German edition of Albrecht Peters’ Commentary on Luther’s Catechisms has long been the gold standard of research on the catechetical texts of the great reformer. 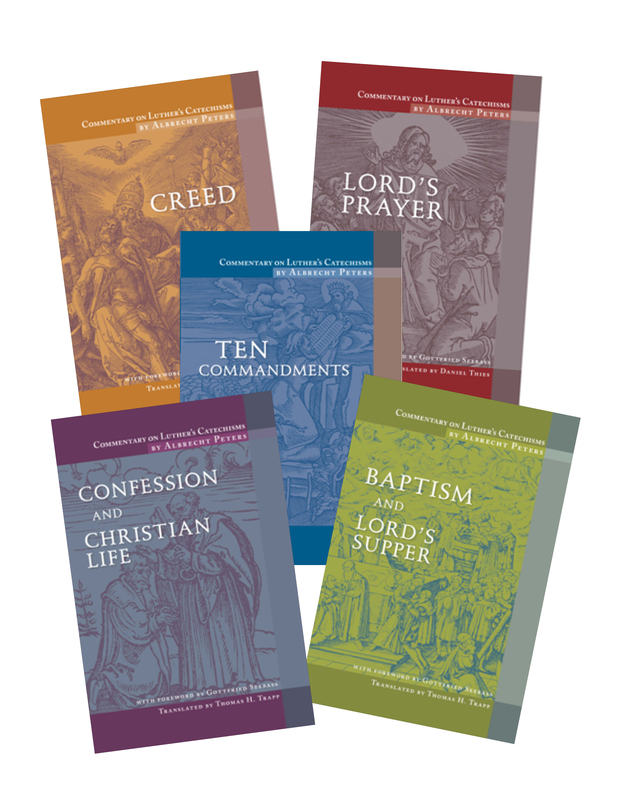 Now English-speaking researchers and catechists can read the fifth and final volume of the series, Confession and Christian Life. This volume, translated by Dr. Thomas H. Trapp, explores Martin Luther's catechetical writings on Confession and Absolution, Household Responsibilities, Marriage, and Baptism, as well as his Household Prayers, within a biblical, historical, and systematic context. CPH would like to extend a special note of thanks to Dr. Trapp as well as to the other two translators who worked on these volumes, Dr. Holger Sonntag and Dr. Daniel Thies, for their excellent work on the series. In what ways is Peters’ commentary on Luther’s catechism useful to researchers, pastors, and all Christians? Peters’ five-volume commentary stands alone today in terms of its breadth and depth. Each volume starts with a history of the development and use of the topic in Church history. So, for example, Peters looks at the history of the development of the Creed and each of the parts. He notes what is particularly accented in terms of its teaching. He develops a thesis about how each part was interpreted at the time of Luther. Luther’s unique contribution in this regard is that he accentuates the pro me, the pro nobis, that Jesus died for me personally, for us. Peters shows how alternate viewpoints skew the understanding of the Gospel and salvation, leading away from the complete peace that is ours in Christ. It was not enough to be “just” a member of the Church at large. Salvation was personal for Luther. Someone might think, “Luther’s catechism is pretty simple. How much more can really be said about it?” Now that you have translated several volumes of Peters’ great commentary, how would you respond? Luther remarked that he himself could never comprehend everything taught in the catechism. I have been captivated by how much is there and how my own understanding and perception has grown. The reasoning provided in the commentaries provides a backdrop for Luther’s insights. I personally recommend these volumes for pastors and teachers who want deeper background for teaching young people, but also to enrich the teaching of adults, whether in instruction classes or for ongoing growth in the faith. It may be that such an observer is unaware of how the “simple” is a distillation of revelation that may be anything but simple. Luther has been accused of being simplistic, maybe even advocating a tritheism (Creator, Redeemer, Sanctifier). Peters addresses the issue by pointing out that the catechism was fashioned as a starting point for teaching the faith. He notes that in his other sermons and writings, Luther fleshes out the complexities of the relationships among the persons of the Trinity and what that means for salvation. Volume 5 of Peters’ commentary deals with several different topics. What are the strengths of this volume? Does this volume challenge contemporary views on these topics? It is most important that the issue of absolution, as a means of grace, is accentuated as central throughout. In each of the topics discussed, peace with God that results in peace with the brother links the two together. For those who would see worship as time for praise and fellowship, this grounds both in the gracious action of the triune God to reconcile us to Himself, which leads to a relationship with others that is based on grace and not just on common interests. The Church provides the place where the Christian faith can be lived out in the specifically Christian life. It will certainly challenge anyone who believes that absolution comes as a result of acts on the part of the believer to satisfy God’s expectations. I found myself less “challenged” and more “deepened” in my appreciation of what is discussed by our Lord in the Book of John already in His first interaction with the disciples on the evening of the first Easter. Of course, for those who seek to relate to God apart from Christ, the entire topic will seem foreign. For Christians who seek peace with God and the neighbor, the sense of release from sin and guidance in the new life comes front and center. You can purchase Confession and Christian Life, along with the other four books in the series, in both paperback and Kindle format at cph.org.